Protect Our Care Illinois urges our Congressional members to reject the proposed House and Senate Tax Reform bills. The House is expected to vote on its version of the bill on Thursday – we need you to call your Member of Congress today! Call your Member of Congress through our partner, Americans for Tax Fairness’ hotline at 877-795-7862 and urge that they oppose these bills! Just like the failed efforts to repeal the Affordable Care Act, the Republican tax proposals would hurt people living in poverty and middle income working families to pay for massive tax cuts for corporations and the wealthiest Americans. To make this situation even worse, Senator Majority Leader Mitch McConnell announced yesterday that the Senate version of the bill will now include language to repeal the Affordable Care Act individual mandate. As the nonpartisan CBO reported last week, repealing the individual mandate would increase premiums, spike the number of uninsured by 13 million and ultimately decimate the private insurance market. Who are some of the biggest losers under the tax bills? People with high medical expenses (e.g., seniors, people with disabilities, people with catastrophic illnesses), individuals with outstanding student loans, and the bottom 35% of taxpayers. In all, the tax bill would harm 36 million families and increase the deficit by 1.5 trillion dollars. The biggest winners? Wealthy individuals and corporations. All we need to do is listen to the White House Economic Adviser, Gary Cohn, who said that “the most excited group out there about the tax plan are big CEOs.” He’s right. The House and Senate tax bills are part of a two-step fiscal agenda. Under both plans, Congress would first cut taxes for the rich and corporations, to then justify deep cuts in critical programs, such as Medicaid, Medicare, Food Assistance and Education next year and for years to come. Make no mistake—the Republican tax proposals are a thinly veiled attempt at Robin-Hood-in-Reverse. The House may vote on the tax bill as soon as today!! Please call your Representative TODAY (877-795-7862) and urge them to vote NO on this unfair tax deal! Tell your Representative you strongly oppose the House and Senate tax bills and any tax proposals that blow up the deficit, gives massive tax cuts to the wealthy, or repeals parts of the ACA. This webinar focuses on the latest developments from Washington, D.C. and Illinois in health care policy and how together we can fight back against the Trump administration’s ACA sabotage efforts. Watch the webinar to hear experts share insights on Children’s Health Insurance Program (CHIP), efforts to stabilize the Affordable Care Act, everything to know about cost-sharing reductions, and essential tips on how advocates can support open enrollment efforts. Protect Our Care Illinois (POC-IL) lauds Senators Lamar Alexander (R-TN) and Patty Murray (D-WA) for working together to craft a bipartisan health care bill. Their approach, unlike Republican led bills, while not perfect, takes steps toward stabilizing American’s access to health insurance by providing two years of funding for the Marketplace cost-sharing reductions; and supporting critical outreach and education activities. This deal was the result of months of bipartisan discussions between Democrats and Republicans on the Senate Health Education, Labor, and Pensions committee including open hearings, where stakeholders, including governors, state insurance directors and advocates testified to the importance of stabilizing the Marketplace and ensuring plan affordability. This is the open fair process that the American people want Congress to engage in in order to find solutions to support and bolster the health care system. POC-IL, like the vast majority of Americans, believes this is the way forward, where elected officials cross the aisle and work together to improve the ACA, not repeal it. Senators Alexander and Murray are demonstrating bipartisanship in action — the best path toward improving the American health care system. Protect Our Care Illinois (POC-IL) stands in strong opposition to the Trump administrations announcement to stop funding the cost-sharing reduction payments that help low and moderate-income consumers afford health coverage and lower their deductibles. After failing numerous times to repeal and replace the Affordable Care Act (ACA) through the legislative process, the Trump administration has reverted to blatant acts of sabotage to tear health coverage from consumers, with no plan to replace it. This move comes a day after Trump signed an executive order aimed at undermining consumer protections in the law. In Illinois, over one hundred thousand working individuals and families rely on the ACA’s cost-sharing subsidies to help cover life-saving treatment. Not paying the subsidies, will send the health insurance exchanges into turmoil and result in fewer Illinois families and individuals having access to high-quality, affordable health insurance coverage. POC-IL like the vast majority of Americans believe this policy shift by the Trump administration harms the financial stability and health of our country. We demand the Trump administration withdraw this plan and call on the Illinois Congressional Delegation, Gov. Bruce Rauner, and other elected officials to speak out against this spiteful, ill-conceived, and fundamentally immoral act. Protect Our Care Illinois (POCIL) stands in strong opposition to the executive order signed by the Trump administration today which will undermine consumer protections in both the ACA and the state of Illinois insurance code by expanding association health plans and short term insurance plans. This executive order is a blatant effort to sabotage the ACA. By creating a loophole for groups and individuals to buy skimpier health plans, the order promises to gut key consumer protections—like those for pre-existing conditions and lifetime caps—destabilize the marketplace, cause premiums to skyrocket, and ultimately reduce access to healthcare. Though all of us will pay the price, sicker consumers, older adults, and working families will be hit hardest. This could also create a scenario in which plans will be permitted to circumvent not just the ACA’s protections, but the protections enacted by the state of Illinois through our own legislature and insurance code. This is not state flexibility—it’s a race to the bottom for insurance, which states who wish to do good may be powerless to stop. POCIL, like the majority of Americans, believes that all people deserve access to high quality, affordable health insurance. It is undeniable that this executive order moves us further from this goal. POCIL calls on the Trump administration to rescind this order and urges the Illinois Congressional Delegation, Governor Bruce Rauner, and other elected officials to speak out against this dangerous order. Together, we defeated Congressional Republicans’ most recent attack on health care. However, it’s clear our fight to defend the Affordable Care Act and Medicaid must continue. Join Protect Our Care Illinois on Wednesday, Oct. 25 at 3 p.m. CST to learn the latest developments from Washington, D.C. and Illinois in health care policy and how together we can fight back against the Trump administration’s ACA sabotage efforts. Protect Our Care Illinois partners will share expert insights on CHIP, ACA stabilization, and cost-sharing reductions as well as discuss how advocates can support open enrollment efforts. Register today to learn about the impact of the FY18 federal budget negotiations and how together we can mobilize our communities to #ProtectOurCare. Take action – Oppose cuts to Medicaid and Medicare! Last week, Illinoisans across the state rose up to once again defeat ACA repeal and protect the vital programs our communities depend on. The victory over Graham-Cassidy is something to be proud of, but we must keep up the pressure as Congress moves onto the next phase of its agenda: tax reform. The tax reform debate will imperil many of the programs we sought to protect over the last year. The House of Representatives plans to take the first step in that process this week by voting on a Budget Resolution that calls for trillions of dollars of tax cuts for the rich financed by gutting Medicaid and Medicare. We must demand that our Representatives stand up to this kind of reverse Robin Hood and oppose this dangerous budget plan. Call your Representative TODAY at (866) 877-3303 and demand that they oppose the House Budget Resolution and any legislation that cuts Medicaid and Medicare. The House Budget Resolution is a radical document calling for the end Medicaid and Medicare as we know it. It slashes Medicaid by over $1 trillion through a per capita cap and the end of Medicaid expansion. And for Medicare, it proposes to cut half a trillion dollars by turning the program into a voucher system. It does all this to provide a $5 trillion windfall of tax cuts for the wealthy. While the Budget Resolution does not hold the force of law, it is the first step towards unlocking the Budget Reconciliation process that allows the Senate to pass major legislation with only 51 votes, just like the process for the ACA repeal fight. The Reconciliation process could allow Congress to enact many of the extreme measures included in the Budget Resolution and must be opposed at every turn. Act NOW and call your Representative at (866) 877-3303 to urge their opposition to this drastic proposal! Vote NO on the House Budget Resolution and protect Medicaid and Medicare! Please check out these resources from our partners at the Center on Budget and Policy Priorities for more information on the House Budget Resolution and the Federal Budget Process. Thank you for helping to defeat the latest ACA repeal bill! Today, Sens. Graham and Cassidy announced there would be no floor vote this week on the Graham-Cassidy-Heller-Johnson bill before Sept. 30. This is a huge victory for Illinoisans and health care consumers around the country. We are so thankful for your advocacy the past few weeks (and months!!) to stop this disastrous piece of legislation. We know that the fight to protect the ACA and Medicaid is far from over, but for now, we can breathe a small sigh of relief. We hope our representatives in Congress will finally turn their attention to the very crucial health care decisions at hand such as CHIP reauthorization, community health center funding, and of course, marketplace stabilization efforts that were derailed by the Graham-Cassidy negotiations. Please continue to use the Protect Our Care Illinois (866) 877-3303 hotline to call your representatives in Congress and let them know that you expect bipartisan solutions to build on and improve the ACA. We will be gearing up for Open Enrollment (starting Nov. 1), because we know that the ACA sabotage will continue and we must remain vigilant. THANK YOU for all that you have done. We couldn’t have gotten this far without your calls, emails, protests, tweets, Facebook posts, congressional visits, letters to the editor, and grassroots community efforts to save our health care system from being dismantled. Republican leaders have not stopped trying to secure votes for the extremely dangerous Graham-Cassidy proposal. We must not stop either. If this bill passes, nearly 1 million Illinoisans could lose their health insurance, protections for all people with pre-existing conditions could be gutted, and the state could lose billions of dollars in federal health care funding ($153 billion by 2037). 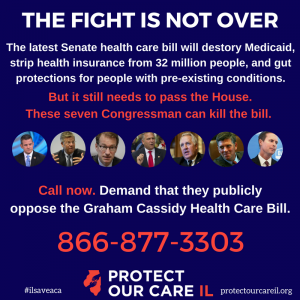 Non-action will harm millions in Illinois: Call your representative at (866) 877-3303 NOW and demand that they publicly oppose the Graham Cassidy proposal. The Senate could vote anytime this week–even without a full CBO score to show the impact on insurance rates, with only a sham hearing in which we saw people living with disabilities forcibly removed, and in spite of the success of recent bipartisan negotiations. If they do not pass this bill by 11:59pm ET on Saturday, Sept. 30, it dies and we can all, celebrate a hard won victory. BUT NOT A MINUTE EARLIER. You can learn more about how Graham Cassidy will hurt Illinois here. Just when we thought the Congress had moved on to bipartisan efforts to improve on the ACA and fund children’s health insurance, Sens. Graham and Cassidy introduced their new and even WORSE ACA Repeal bill. Unfortunately, this bill is gaining steam as the Senate has only until Sept. 30 to pass it with only 50 votes. We need to fight harder than ever to stop this last ditch effort to strip millions of people of their health insurance. In Illinois that means calling on our members of the House to publicly oppose the Graham-Cassidy proposal. If this bill is approved in the Senate, it still needs a vote in the House. Public opposition from the House NOW could stop this bill in its tracks–yet many Members of Congress from Illinois have been silent. We need you to call your Member of Congress today (1-866-877-3303) and tell them to publicly oppose the Graham-Cassidy bill – which could come to the House as early as next week! The financial impact of Graham-Cassidy in Illinois is clear. An Avalere report shows that Illinois would lose $8 billion dollars for Medicaid between 2020 and 2026—money that will be given instead to states that did not expand Medicaid. When this block grant expires, Illinois will lose $10 billion in 2027 alone. Resurrect – and worsen – the devastating cuts in coverage and benefits that the American public and the majority of Congress have already rejected. Please call your Member of Congress today (866) 877-3303 and tell them that the Graham-Cassidy bill is extremely harmful to Illinois families. Tell them you want them to return to the bipartisan talks that were finally starting in Congress to stabilize the Marketplace. Thank you for all that you have done the past 9 months to help Protect Our Care and defeat the continuous onslaught of ACA repeal bills. YOU are the reason why we have gotten this far!